I was told I won a Thoof contest. I forgot all about it and wasn’t sure if it was real. After I clarified and read on PPP’s forum, yeap, I won because I drove most traffic to Thoof. My post was just a regular, off the handle kind of style. I type what I think. My Ingrish veli bad and in case you guys do not know what is “What the thoot is Thoof?”, never mind. You have to be Hokkien to understand wa kong hamik thoot. Ar bo lu khi hor kau thoot. My post Tell Thoof 5xmom rocks has driven most traffic because you guys have helped me clicked and visit Thoof. It is a good site with lots of gossip news to read. I won USD300 in a Visa debit card. It is not the money but the fact that all of you, my dear, darlingss bother to help me click. The joint efforts that you have all put in. Sayangggg…betul. Muacksss. Kehkehkeh…geli nyer…tolong pergi baca apa itu cilaka CCB angmohs cakap, anggur masam semua. I got the official email from PayPerPost and the announcement was made on the PPP forum. 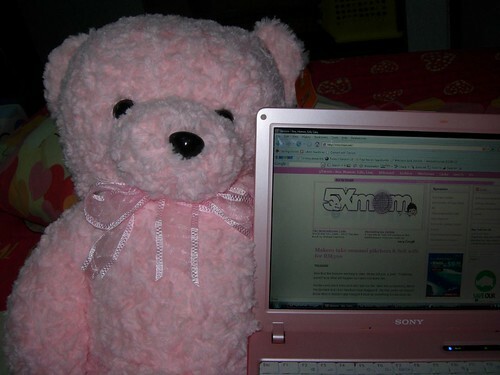 Anywaysss… we went shopping just now and I found this adorable, pink, fluffy, soft teddy bear. The fur looks like little roses. iWant iWant iWant. And my loukong bought for me. Pin thai jor…..mou pan fatt….second childhood. That’s how Malaysia five digit income blogger works. 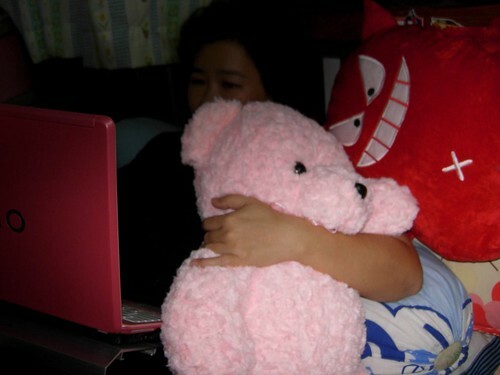 From bed, with a pink teddy, pink Vaio and a red devil. BTW, do you know that my Make$ Money$ blog has been changed to pink too? In case you are not aware, I made RM14 K in August income. You can read Mohd Ismail review. So, thank you to all of you guys for the support. It means a lot to me. When I am richer, I kasi angpow again, ok? BTW, does anyone know which charity body I can donate by PayPal? I tried Unicef but they no longer accept PayPal. I have the money meant for the Blogathon, my birthday and Terence’s money to get rid off. YESSSS!!!! Keng-nye lu mya SEO, apa dia orang cakap banyak kat tu cb forum. wahhahhaa damn syok i tengok those angmor anjing anjing betina yang tertentu tak kam wan 5xmom menang. Tahniah, 5xmom memang the pride of malaysia. wuah! announce your income pulak, not sked inland revenue knock on your door kah? not to worry hor, got accountant punya ahbang! Wahhh… ang moh char bors bo hua hee big time hor…. Sore loser… Hmmm…. Anyways, Lilian ah… Keong Hee!!! keong Heee!!!! Aiyahssss! Takes thes USD300s ands gives tos thoses anggurs masams angs mohss lahs. USD300s theys alsos jeless. Gives tos thems lorsssss. Tiussssss! Woo Hoo! Doing happy dance. Happy Dance. That’ll go nicely into the retirement fund for Toy Boys. 5xmom bukan cakap besar sahaja. Dia memang besar. Hari ini tentu ada banyak anggur massam. Muahahahaha. Byran – Ok ok, Got USD20 for Serge blogathon which I was supposed to donate to UNICEF but they don’t accept PayPal. USD20 + USD20 (terence, lu mia duit ha) from Ray and eek, Adrian (?) shares. Total round up/down to RM200. On my next cash out. giddy – No limelight, rotten eggs got lah. whojen – Heh, I don’t want. laucharbors – Memang, sangat tulan sama saya langsung tak mau kongratulasi saya. steven – Hoi, kenot, later the sharks defender flame me. I quiet quiet eat dare not blog also. Mee suah kor (fake hu chi) can or not? alex – Woi, you got one liao, somemore what angpow? wuching – Hoi, I am not criminal lah. Pay when it is due. Or when they can proof. I lied mah, where got proof? anthraxxxx – Itu orangs semua memang tarak kerja, hari hari cari pasal. satkuru – Ya, favourite pastime. Samm – Yes yes yes, #1! I read the forum and mereka anggur betul,tak beri tahniah.I ingat dia orang sangat gentlemen punya. Apa krativity, apa best inglish…rubbish lah…advertisers mau seo ,mau rankings dlm search eniges saja lah. Like that can belanja makan liau lor? Kopi also kopi lar…………… congratulation to you. You make we women proud. Men can make 5 figures, ladies also can – you are one of the good example mah. Perempuan BOLEH!!! Gee.. izzit legal to ask how do u withdraw ur money from paypal arrr? cbenc12 – My method legal wan lah. Choy…..I got a friend who has a Singa-poor bank lor. You want my kawan mia’s contact? I no responsible if he lari lah but so many of us friend friend him. He lengjai mah. LOL. froginkl – Shiok kasi anggur masam lagi masam. lawrence or erina ah? – Must know gender first baru dare to reply. vedis – Yalor, terang terang tak mau kasi muka sama saya, lagi saya kacau taik sana. Pingback: Make$ Money$ - Truth, no scam » Blog Archive » Phweet! Got my USD300 VISA debit card from Thoof and PayPerPost!